A couple of weeks back we had Ride To Work here in the UK. In fact, this year, they made it a week. I decided to film my ride to work using a different mount each day. I wanted to take the 27 minutes and mix together the best 3. After three years of experimenting with my GoPro Hero2, I'm pretty happy with this finished product. 1) Helmet cam is fine for collecting evidence but the film makes the viewer sick if the rider is any good at observations. When in doubt, hard mount. 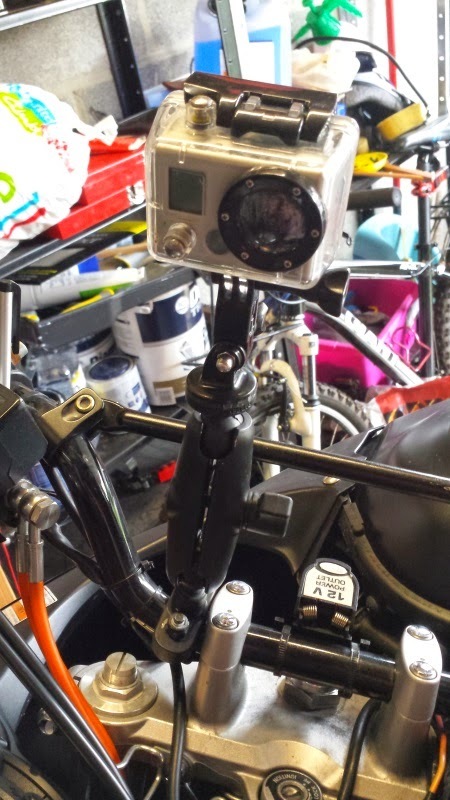 3) Converting your GoPro to RAM mounts is super secure and versatile but the down side is RAM mounts they vibrate A LOT more. 4) The closer the camera is to the ground the better. Makes it faster. More exciting. 5) Try to get a bit of bike in there. I love frame mount perspectives that capture the movement of the suspension. 6) The best place to record sound is closer to the airbox, not the exhaust. 7) Bad aim makes the film unusable. Generally horizon should be 1/3 from the bottom. Strangely, left/right is less important. 8) Editing isn't optional. No matter how long you rode, good films last 3-4 minutes or if you have no usable sound, one good song. I find you spend roughly half an hour to an hour editing 1 minute of footage. Like I say, these are my opinions. To be honest, I hadn't realized I had so many of them. The only other opinion I have is that I'm not very good at any of this, proven by the fact that that was probably my best effort to date. Here's what production looked like. 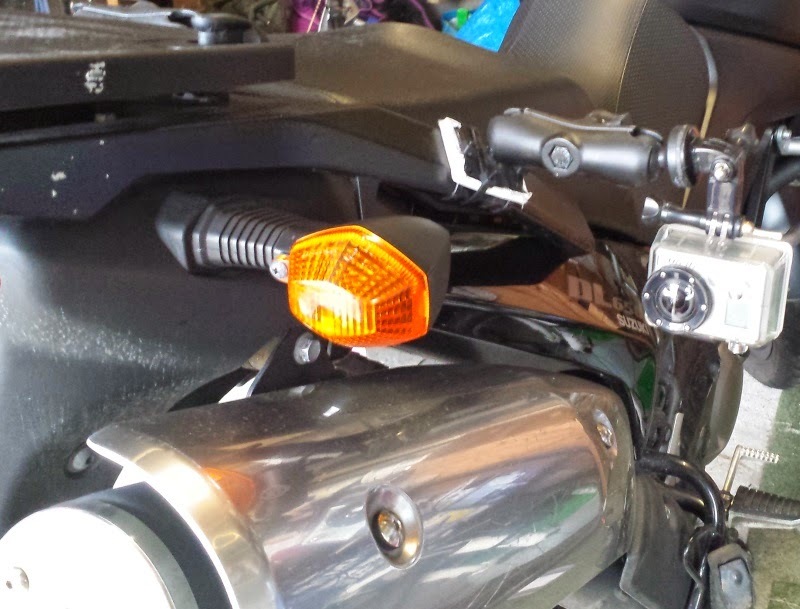 Day 1 - Mounted to the handlebars using ram mounts. It's a little shaky but this gave the best sound. Day 2 - Ram mounts on the grab rail rear facing. Pretty cool perspective and OK sound. Day 3 - Helmet mount. This is an easy option but it makes you sick watching it and the sound is atrocious. Still, had to be done. 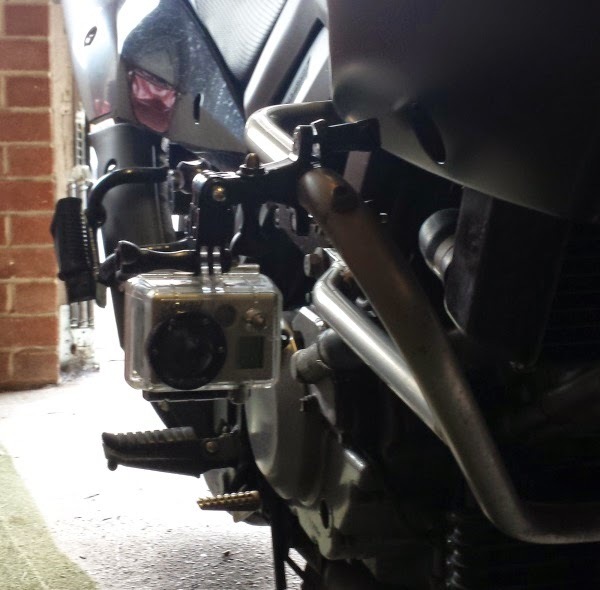 Day 4 - GoPro's own tube mount onto my crash bars. The sound is very mechanical but the perspective is thrilling. Editing took forever and isn't even close to fluid but I did my best with the time I had during the week. I find the GoPro editing software buggy to the point of unusable so I did it all on an iPad 2 with iMovie. I've also used Windows Live Moviemaker fairly successfully. However, for reasons I really can't explain, I prefer using the I pad. Bahhhh! I've no real wish to try any other editing software but I'm all up for finding new mounts. One day I'd like to try a chest harness as it looks to have a good view and less shaky but without the bobbing about a helmet mount does (if your making propper observations). Then again, what I'd really like is to mount my camera on someone else's bike, preferably someone who can keep up without getting dangerous. Currently, I don't know that person. I wonder if he/she is any good at editing? Now if only I could remember all the other comments I wrote that wouldn't publish!